This October, NASF Policy Director Robyn Whitney attended the Society of American Foresters’ (SAF) 2018 National Convention in Portland, Oregon. Attendees discussed how science, management, and policy interact to influence the conservation of forested landscapes. 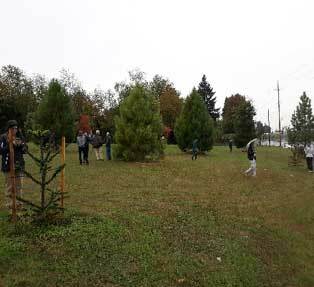 As part of the convention, members enjoyed a technical tour of local, large-scale urban forestry programs. 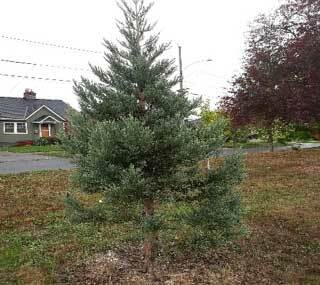 In Portland, street trees are used to reduce stormwater runoff and protect public health. 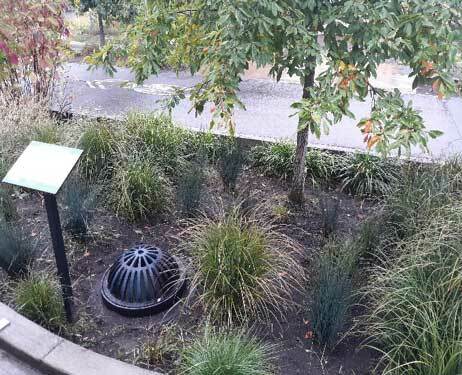 Recently constructed rainwater infiltration facilities at Holman Park manage runoff from 16,100 square feet of concrete and asphalt. These improvements also protect vulnerable road users and reflect community input in their design. 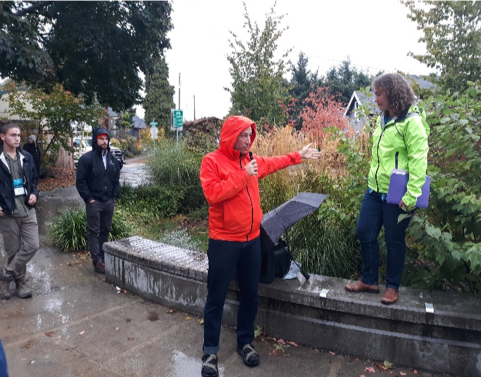 Left: While touring the Holman Park improvements in Portland, a local resident joined our group to talk about the community’s appreciation for the park’s new purpose. “We see kids riding bikes and celebrating birthdays in a park that was previously a haven for illegal activity and speeding traffic. This is now an area where the community can gather safely and enjoy the park.” Photo credit: Robyn Whitney. Right: A stormwater bioswale in Holman Park filters runoff from the surrounding asphalt. Photo credit: Robyn Whitney. In Roseway, neighborhood residents spearheaded a collaborative planting program to replace dying trees in their community park and create more species diversity. The new canopy of trees will provide shade and wildlife habitat, filter air pollution, and boost home values. Left: Young Sequoia were planted in Roseway to increase biodiversity and canopy coverage. Photo credit: Robyn Whitney. Right: Monkey Puzzle and young Ponderosa Pine thriving in the Cully-Concordia International Tree Grove, an urban arboretum in North Portland. Photo credit: Robyn Whitney. 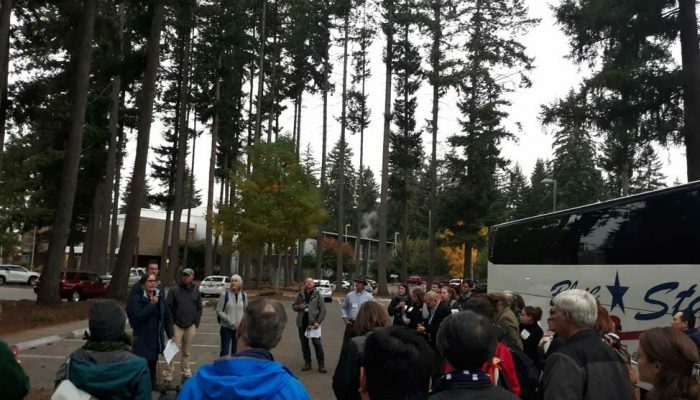 In nearby Vancouver, Washington, the city’s Urban and Community Forestry (UCF) program maximizes the aesthetic, environmental, and economic benefits provided by urban trees with innovative projects. The Firstenburg Community Center, for example, features preserved Douglas firs, landscaped plant beds in parking lot islands, and pervious parking lot surfaces that filter stormwater. Community volunteers tend to landscaped beds through mulching, pruning, and planting efforts. The City of Vancouver funds its UCF program through stormwater funds, which residents pay through their water utility bill. This dedicated funding stream is critical to the success of the program. 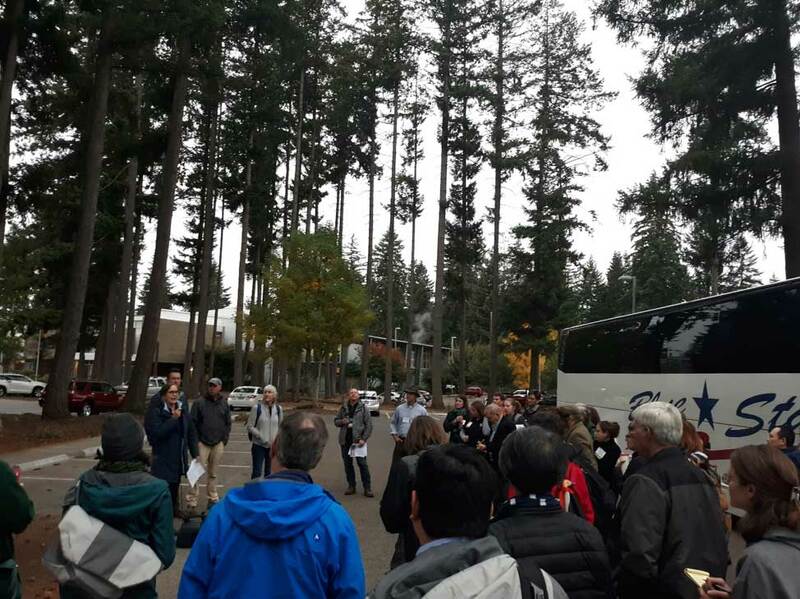 Standing on the pervious parking lot material at the Firstenburg Center in Vancouver, Kristin Ramstad, the UCF program manager with the Oregon Department of Forestry, explains how the site was developed within a mature Douglas-Fir stand. Also presenting to the group was Linden Lampman, UCF program manager for the Washington Department of Natural Resources, and Nick Redmond, UCF specialist for the City of Vancouver. Photo credit: Robyn Whitney. The National Association of State Foresters would like to extend special thanks to Danielle Watson of SAF, the Oregon and Washington UCF program leads, and the UCF staff with the cities of Portland and Vancouver for an excellent field tour.